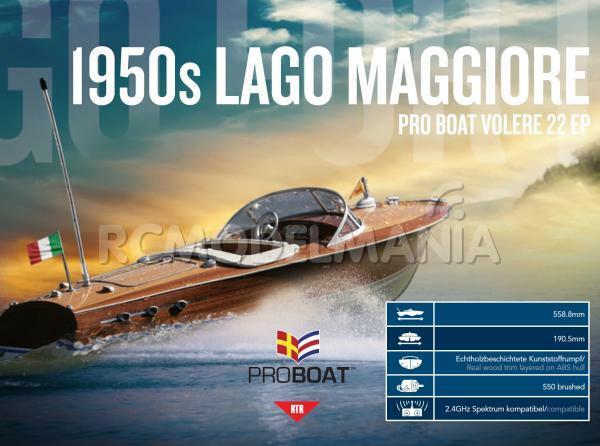 Evocatively styled after the wooden-decked speedboats from the 1950s and 60’s the ProBoat Volere 22 has become synonymous with the classic chic and style that proliferated the shoreline of the Italian Riviera and beyond throughout the period. Famed for their attention to detail, opulence and sheer beauty, these wooden decked, v-hull speedboats epitomized the sense of class and elegance of the time and it’s only fitting that the ProBoat Volere 22 shares the same attention to detail and stunning beauty, albeit on a much smaller vessel. The Volere 22 features a lightweight yet resilient ABS hull structure that has been painstakingly hand-covered with real-wood layers to achieve a depth of finish that is as timeless as it is stunning. At just under 660mm long (22 inches), the Volere 22 is equally at home as an ornamental show-piece (thanks to the included display stand) as it is carving the shorelines of natural waterways, effortlessly powering through the waves thanks to the water cooled 550 sized brushed motor. Chromed windshield surround, seat detailing and hull fixtures abound throughout this stunning R/C model, making the Volere 22 a joy to behold as well as to command. A ProBoat 2.4GHz Radio with Spektrum Marine technology means that you’ll always be in control of your own destiny as the advanced R/C system uses cutting-edge technology to eliminate the need for frequency crystals and associated troublesome interference. A 7.2V NiMH rechargeable battery is included along with a charger and because its ready-assembled, you can be ready to sail in less the time it takes to charge the battery.